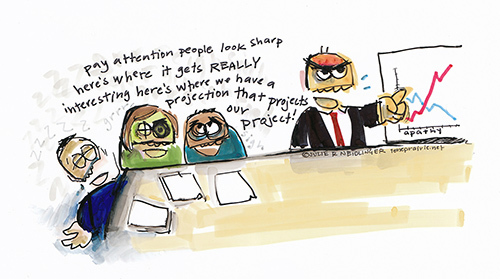 We are in meetings regularly but how many of them are productive? The minutes grind by slowly as the group argues over what it’s supposed to be doing and everyone is anxious to get back to their desks. A couple weeks later, you repeat the same meeting because no one remembers what was decided or who was responsible. I’ve been there hundreds of times but it improved about fifteen years ago when I began following the principles in How to Make Meetings Work by Michael Doyle and David Strauss (1993). It introduced me to the value of agendas, the decision-making process, and the important role of a facilitator. The facilitator is a neutral third party whose sole purpose is to manage the meeting process and ensure it is productive. He or she doesn’t make decisions but helps the group discuss issues collegially to arrive at decisions thoughtfully. The facilitator makes meetings easier, putting grease on the gears that would otherwise grind and bind. If you’re a regular reader of this blog, you are probably serve as a facilitator from time to time. This entry was posted in Governance and management, Training and tagged American Society for Training and Development, Cyndi Maxey, Michael Wilkinson on May 14, 2014 by Max van Balgooy.